I will start by saying this past weekend was bad enough to experience, i dont need to hear what I did wrong. It will NEVER happen again. I want to post my story so maybe it wont happen to anyone else. Please don't beat me up. We have a cabin that my husband and I try to get away to as often as we can and we take our entire animal family along with us. Tattoo and our 2 dogs. Saturday was a beautiful day, warm, sunny and wonderful... until this unforgettable event. I sitting on our deck with tattoo (yes, he is clipped and not tethered) He was on me for hours and i got up to put him in the house. I think a pole near to door spooked him and he took off. The problem was not that he flew (cause he could not get lift) but the cabin on a very wide rushing trout stream. A fisherman was in the middle of the stream and lucky for us saw Tattoo as he flew by him. The air pressure off the stream enabled him to soar.. and Soar he did. He went at least 100 yards if not more. I was not sure if he cleared the water or not. We went into major panic. I figured if he hit the water he was a goner. My husband took off through the water (it's waist high). When he got to the point that the fisherman saw him landed, he could not find tattoo. Even though tattoo was screaming right after he landed, he went silent once he got to the other side. Being spring and everything is green, he was hard to see. Getting to the opposite is not car accessible. I thought of taking my car through the water but I was not sure i would of made it. After driving down the road in a panic and over the bridge to see if there is any type of access to the spot across from where our cabin is, i soon discovered there was no way i could get through the thick woods. I drove back, in tears, and just prayed that my husband had him by now. No such luck. Feeling totally helpless, i grabbed some water shoes and started my hike to the other side. At this point my husband was so deep into the woods that he was out of ear shot. After falling in the water a few times, i finally made it over. The fisherman at this point kept looking also on the waters edge. I got on the shore and kept calling for him...and i hear the fisherman say.. I see him. My first question was.. is he dead. he said.. NO. i see him. I ran over to where he was and sure enough there was Tattoo, basically where he landed. Right over the water on a branch not more than a foot over the water. He was wet and scared. I put my finger out and he jumped right on it. The fisherman was so nice. He offered to give me his shirt ( I was soaked) and being spring in Pennsylvania, i can tell you that the ice recently melted on the stream. I said, no I will be ok.. he says, not for you!.. for Tattoo. My first smile after this scary event. I held him against my chest, and kept him as warm as possible. The fisherman walked me across the rushing water. My husband was still our of earshot. Finally he heard me as I yelled that I got him. He didn't really believe me. He figured i was just trying to get him to come home. He had no clue that i had come across. All in all it taught us NEVER to trust that even though Tattoo isn't going to fly away from us, when he is spooked he will take off. Its not the predicable times we need to be worried about, its the unpredictable ones. It is a day that will never be forgotten and we are so happy to have our baby back... As we told story at work, we had to laugh (now that we can). As hubby was trying to get though the water, over the slippery rocks and rushing water, he kept saying.."I am coming Baby.. I am coming. I am coming to get you baby." The fisherman said to me as we were walking back.. what's the his name.. I said Tattoo.. He said, i thought it was Baby. He also said in the 30 years he has been fishing he has never caught a Parrot. Tattoo is fine and is none the worse for wear... and lesson learned! Thank you for sharing the story. 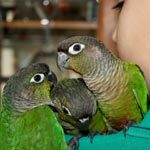 It is such a valuable lesson for owners of clipped parrots and I hope everyone that has a parrot (clipped or flighted) can read this and understand the dangers. I'm glad it all worked out fine but as much as you can imagine, there was a tremendous luck component that the bird made it across the water. So I want everyone to realize that it could have easily ended up not a happy ending and to remember that when taking any parrot outdoors. I'm so glad you found your baby. I can't imagine how panicked you must have been. I am glad you shared your story and I hope that everybody reads it. 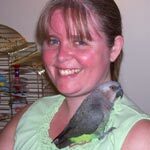 People with clipped parrots tend to think that it's perfectly safe to take them outside but even clipped they still need to be on a harness! Thanks for sharing this, it really serves as a great reminder for all of us! Thanks for sharing your story. I can't imagine how panicked you were ... I know I would be freaking out. I'm glad you found Tattoo and he's ok. Senegal's are definitely known for being phobic ... my Jessie freaks out at large objects or loud unusual noises. 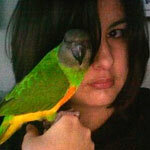 We take our birds to the trailer with us and I'm always very diligent - overly cautious when we are there. I'm so happy you got Tattoo back. I can't imagine how horrible that would be. Glad he is home and safe now . thanks.. i still get panicked just thinking about him being out in the cold and being scared if we could not of found him. I want to use a harness on him but it's near impossible. The breeder tried to get him flight suit ready but something must of happened and he FREAKS out. AND bites us soooo bad. I keep trying it, introducing it, but to no avail. He just hates it. I cut the bottom off the flight suit so it is only around his body but it doesn't help either. Are there any suggestions.. invisible one? I can't get my Senegal in a harness either. I'd love any tips on that. I've been following the articles Michael wrote regarding Flight Harness Training. I'm nowhere close to getting one on Mojo again, but at least I can pick it up and get it close to him now. He'll stick his head through part of it to eat sunflower seeds but that's as close as I've gotten. I think it will be months, if ever, before I get him in it. He used to like it when he was younger but he has decided he absolutely hates it now . The Aviator harness works well. You're going to need to use a combination of flooding, negative reinforcement, and positive reinforcement. Give it time and make sure you don't push the bird too hard to wear the harness. Here's an article about how I taught Kili to wear it in just 3 days (after developing a phobia of it).